After spending eight weeks on a boat, I am glad to be back on solid ground. 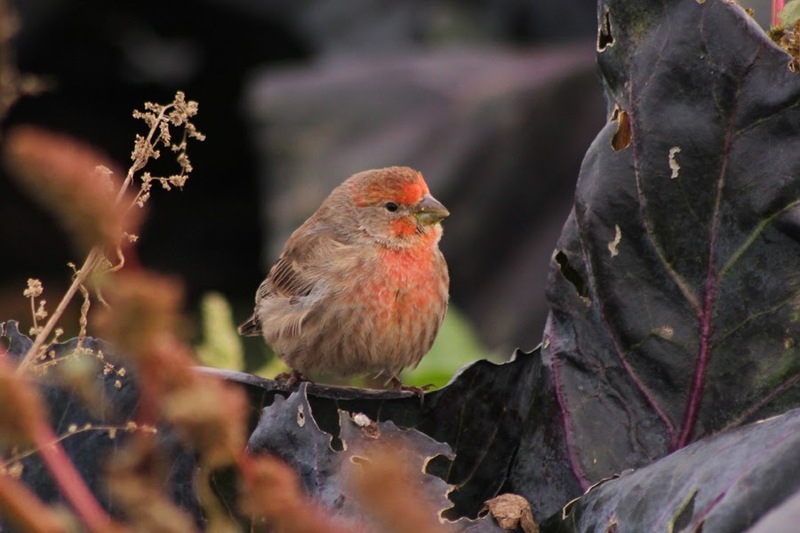 All I want to do is wander around back on familiar territory and get reacquainted with the local birds. I did exactly that today and decided to take my time and walk around some nice habitats on the Saanich Peninsula. I started off my day around the Victoria Airport. While driving along, I spied a hawk sitting out on a perch near the runways and decided to turn around and check it out. While determining it was just a Red-tailed, I was fortunate enough to have seven Sky Larks fly up and circle around for a few minutes. Not a bad start! On a whim, I decided to get out and scour the hawthorns and blackberries around Sandown Park, which is the location of the old horse racing track. It is certainly an interesting area and I could see something interesting turning up there. I couldn't draw anything exotic out of the shrubs today, but I had a good variety of the usual suspects. The highlight was a couple of Lincoln's Sparrows that offered up good views with a bit of coaxing. Next, I made my way over to John Rd. to see if I could track down any good sparrow flocks or perhaps find a shrike out in the fields. While driving, I spotted an American Kestrel as it flew off the top of a tree and proceeded to land on a snag. Before hopping back in the car, I looked at another snag and was graced by a nice adult Cooper's Hawk. I didn't make it too far before I noticed a decent-sized blackbird flock and I put in a rather frustrating effort trying to sift through it for either a Rusty or Yellow-headed. The flock never did cooperate, but I have a feeling it could hold a gem. I'll keep it in the back of my mind for a visit in the near future. The rest of the fields were rather barren, which was disappointing. I put in a quick stop at Patricia Bay to see if I could spot the Snow Goose that was reported there. I always like to double check reports of white geese for Ross', but the only non-Canadas I could find were a couple of juvenile Greater White-fronted Geese. Other waterbirds in the bay included: Greater Scaup, Surf and White-winged Scoters, Horned Grebe, Common and Pacific Loons, Common Goldeneye, and Red-breasted Merganser. Next on my agenda was a stroll around the Vantreight bulb fields. 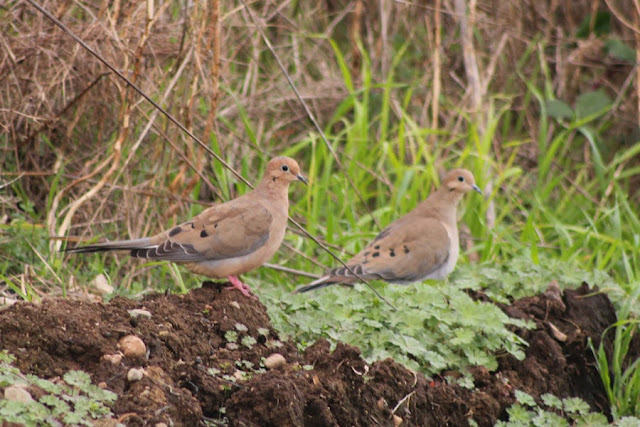 The birding was relatively slow, but I managed to spot a few decent birds. The fields just north of the greenhouses had a single Western Meadowlark and four American Pipits. 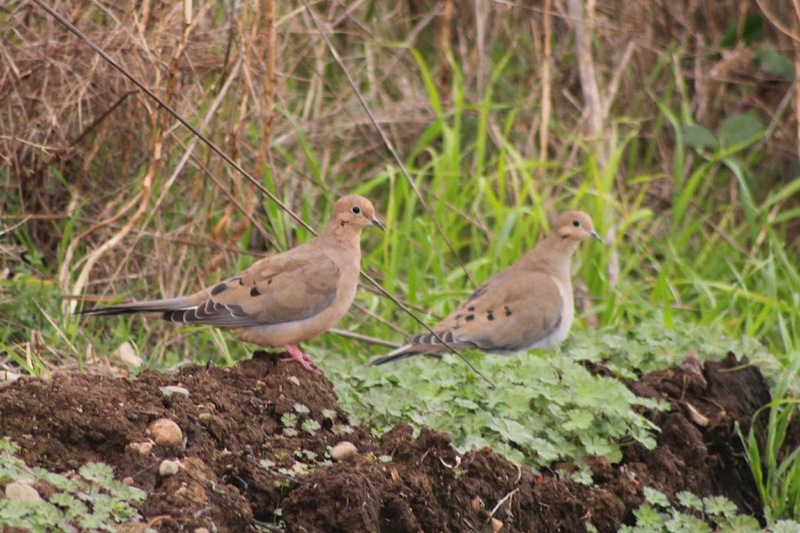 Over by the westernmost reservoir, I had a pair of Mourning Doves, a Wilson's Snipe, and a couple of Lincoln's Sparrows. By the end of the day, I gave up on trying to dig out my own uncommon birds and decided to see if the two Palm Warblers reported from Martindale Flats were still around. As I drove along McIntyre Rd., I got extremely distracted by the geese. I enjoy the variety of geese you can encounter in Victoria from fall through spring. 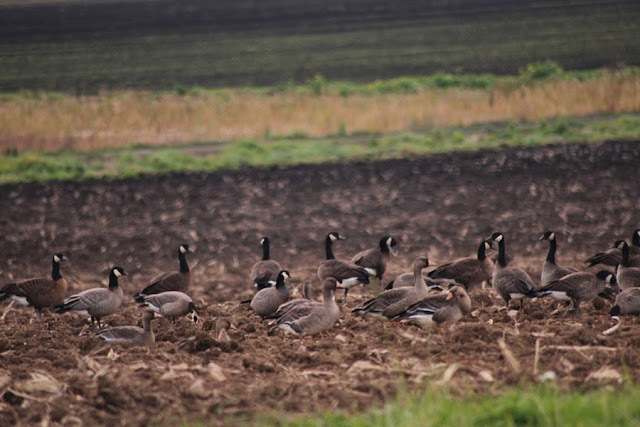 In one flock, I had Cackling Geese (Branta hutchinsii minima), Lesser Canada Geese (Branta canadensis parvipes), Dusky Canada Geese (B. c. occidentalis), and Greater White-fronted Geese (Anser albifrons). If I took my time and analyzed them a little closer, perhaps there was another subspecies or two in there like taverneri and whatever our mutant residents are called. 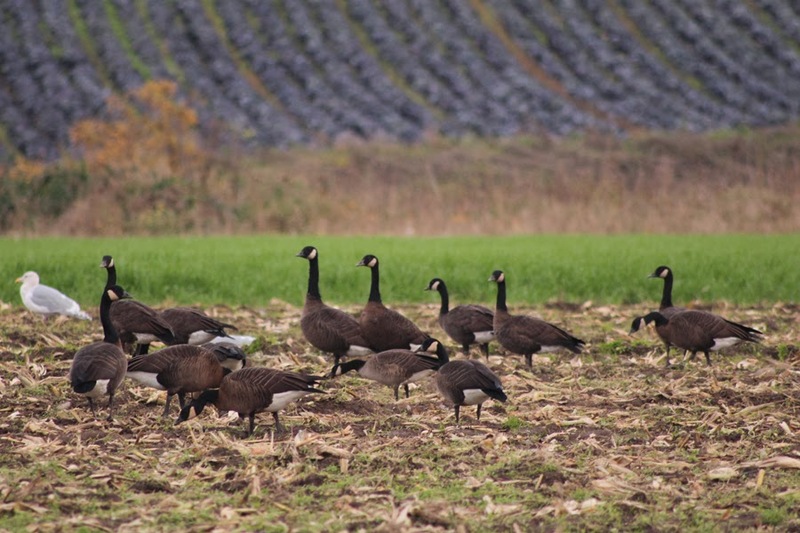 The darkest geese in our local flocks over the winter are Dusky Canada Geese. The middle bird, I suspect, is a Lesser Canada Goose. 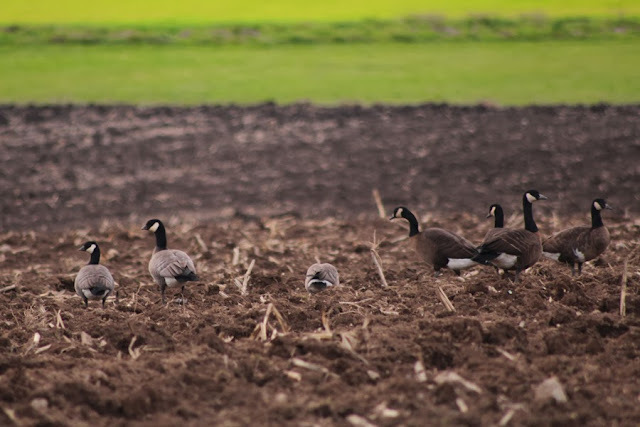 The three birds on the right are Cackling Geese and the four on the left are Dusky Canada Geese. 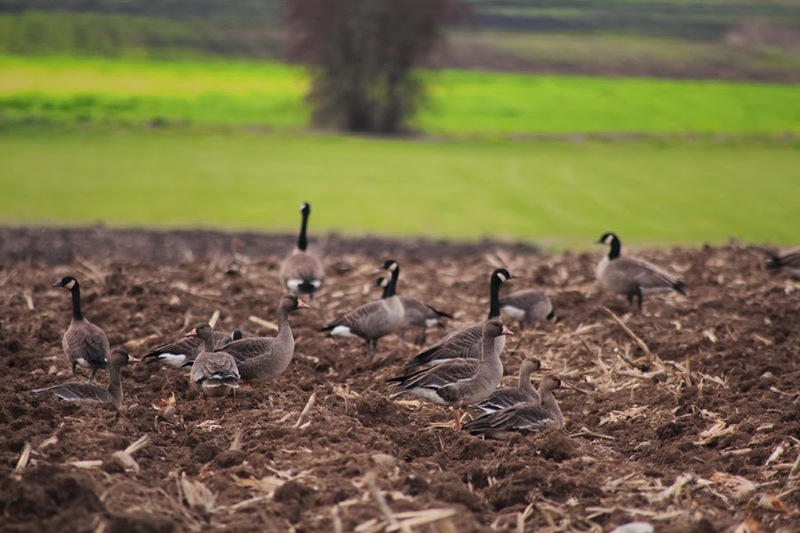 I believe the Cackling Geese belong to the subspecies minima. 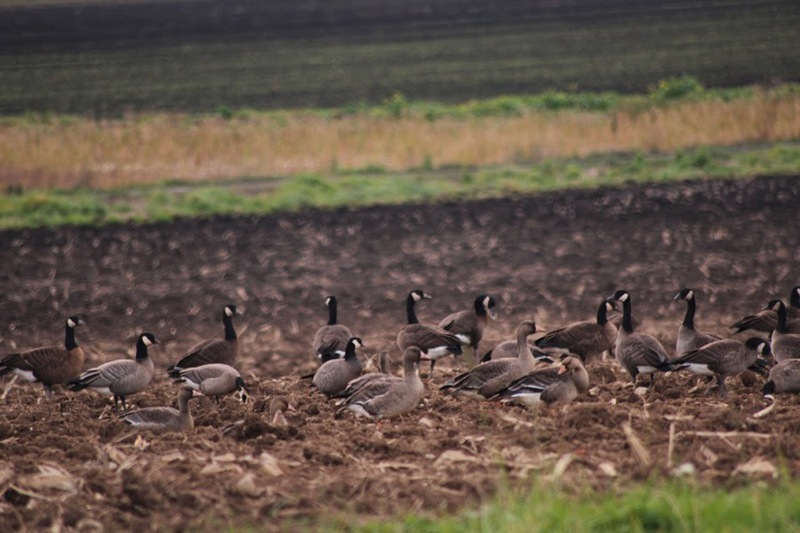 The six birds in front are Greater White-fronted Geese and the ones in behind appear to be Lesser Canada Geese. All of the aforementioned taxa are in this photo - test yourself! Finally, we'll get to the star species of the day: Palm Warblers. I rounded the bend at the end of the lane that leads to the western edge of Garcia Nursery and recognized the Reader-Lee family unit all aiming cameras at some ornamental maples. I figured this was a good sign. As suspected, they had located both Palm Warblers and were documenting the tail-bobbing birds. Despite the light starting to get a little low, we all worked our camera skills to the best of our abilities. 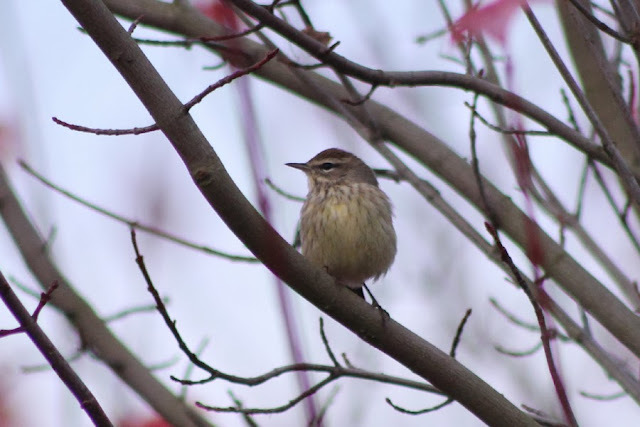 It was nice to hear this was a lifer for Emma and Rebecca and it caused me to recall that my lifer Palm Warbler was only a few hundred metres away... twenty some-odd rotations around the sun ago! It was a great way to cap off a relaxing day of birding back on my home turf. 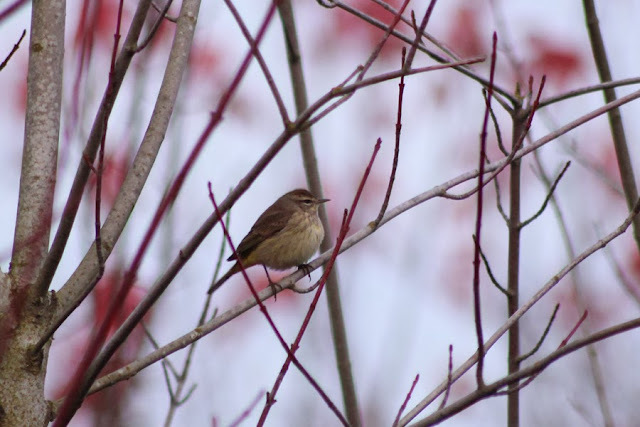 When you capture a Palm Warbler in dull light, it really doesn't do them justice. The vivid yellow undertail created great contrast to the drab brown back and the cap still had the slightest hint of chestnut. This is even worse - I make Palm Warblers look like the drabbest birds in the world. You'll just have to take my word for it when I say it rocked its own style of charisma!